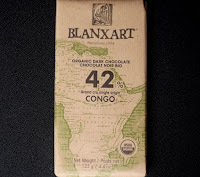 Welcome to Day #14 of Chocolate and Africa Theme Weeks. We're sampling cacao (in chocolate bar form) from the Republic of Congo today—and larger Democratic Republic of Congo (DRC, aka Eastern Congo) yesterday—as we move through Africa from east to west. Cacao grows up to 20 degrees north or south of the Equator). Africa contains several countries that are located within this large possible growing area (including Madagascar, Tanzania, Uganda, the Republic of Congo, Eastern Congo (DRC), Ghana, and Ivory Coast). 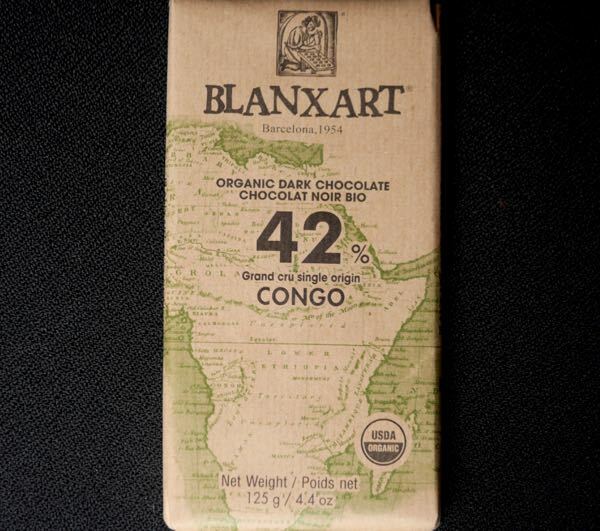 Both yesterday's Original Beans 55% cacao bar and today's Blanxart 42% cacao bar were organic, milk chocolate bars made with fair trade/fairly traded cacao from the Congo region. Both Congos border the Congo River Basin area. The origin for the cacao in today's bar was from the Mountains of the Moon. Blanxart explains: "Between the East African savannahs and the vast rainforests of the Congo Basin lie the ice-covered Lunae Montes" (Mountains of the Moon)." Here approximately 100 farmers grow the organic Mountains of the Moon cacao used to make today's bar. 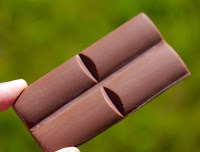 Today's 42% milk chocolate bar, made in Spain with certified organic cacao, was quite a bit sweeter* than yesterday's 55% "dark" milk chocolate bar. It had hints of fruit and sweet caramel and vanilla.